Destination Tohoku discovers what’s on offer for the many tourists flocking to Aomori in Northern Japan each winter. CNN journeys up the snowy peaks of Mount Hakkoda to one of the most popular onsens (a Japanese hot spring) in all of Japan, Sukayu Onsen, which can host up to 1,000 bathers at a time. 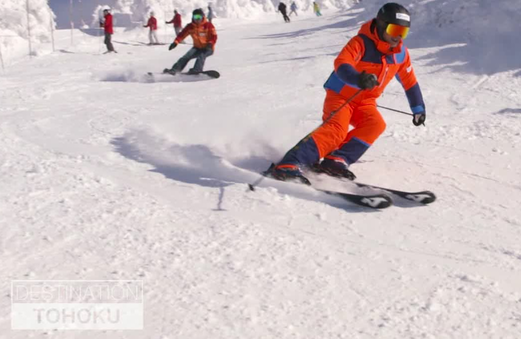 The programme explores one of the region’s most well-known ski resorts, Zao Onsen, with local Hidetaka Ito, a former champion skier. CNN also has a taste of Tohoku hospitality at the all-you-can-eat Azumaya noodle shop and skis in between the Yamagata town’s famous “snow monsters”. Lastly, CNN takes a trip on the historic “stove train” which runs along a picturesque snow-covered route through the Tsugaru Peninsula each winter. Conductors warm the 1950s-era passenger car with potbelly stoves at either end of the train while passengers sip on locally produced sake and grill dried squid on top of the warm iron stoves. On Business Traveller, CNN investigates the trend of “Business Leisure”, whereby holidays are added on to the end of a work trip. On the programme, host Richard Quest tasks CNN’s Isa Soares with learning about how business leisure, or “Bleisure”, is changing approaches to business travel. In Copenhagen, the so called “happy capital”, Soares explores how technology is making travel easier and delves into the science, the psychology and the innovations behind happy travel. Iconic Qatar reveals the heart of the Gulf state through landmark buildings that define its past and now shape its future. CNN explores the landmarks of Qatar from an ancient fort in the great expanse of the desert to the sleek contours of a futuristic museum in downtown Doha. These are buildings that embody Qatar’s DNA and whose influence ripples out far beyond their walls. Perched on the edge of the South Pacific, New Zealand is a small nation with a population of just over four million, but rugby has put the country on the map. The All Blacks are the most successful sports franchise in history, having achieved three World Cups and won over three-quarters of the matches they have played in their 125-year history – more than any other major national sports team. There is a club in most of New Zealand’s small towns, just about every news bulletin carries a rugby story and there is even a television channel dedicated to school rugby, which helps attract young All Blacks talent. For New Zealanders, rugby is not just their national sport, it’s part of their national identity. On CNN World Rugby, the programme speaks to brothers Beauden, Scott and Jordie Barrett to find out how one family produced three star players for the All Blacks. CNN also meets Black Ferns player Kelly Brazier, who explains why the women’s game is growing faster than the men’s in New Zealand. Lastly, the programme visits Auckland Grammar School to meet the future generation of rugby players. Like all cities, Dubai is shaped by those who live in it. Before the discovery of oil, fishermen and merchants along the Gulf found a safe haven in the city’s old trading port, the Creek. Four decades later, Dubai has become one of the world’s most glamorous and futuristic destinations, with over 200 nationalities making up the fabric of the desert city. On Dubai POV, CNN goes beyond the sandy beaches, skyscrapers and seven-star luxury to discover the city through the eyes of those who know it best: creatives, street wanderers and modern-day adventurers who call this melting pot of cultures home. With guides including model Jessica Kahawaty, influencer Ahmed Al Nasheet, designer Nathalie Trad and king of the local nightlife, DJ Dany Neville, the programme explores the art galleries hidden away in Dubai’s industrial area, the oldest restaurant in the city, the growing parkour scene and kayaks in the Hajjar mountains – there’s more to the city than meets the eye. This month, Supercharged attends the Mexico City ePrix to follow the electric racing action and delve in to the City’s green transport credentials. Host Nicki Shields interviews the winner of the Santiago ePrix, Sam Bird, on board Mexico City’s solar powered cable car. Also on the programme, Shields receives a guide of the Mexico City track from British racing driver Dario Franchitti and provides race reports from both Santiago and Mexico City. CNN also explores a biodigestor company which turns cacti into energy. The biogas produced is used for making corn and cactus chips, as well as in a genset for electricity. Some of the biogas is cleaned of carbon dioxide and provided as biomethane, which can be used in modified vehicles. On Quest’s World of Wonder, CNN’s Richard Quest explores Helsinki to find out why the Finns are, according to the UN, the “happiest people on Earth”. During the programme, Quest discovers the rules of the Finnish Sauna, a place for physical and mental relaxation, with former Finnish Prime Minister Alexander Stubb. Quest also learns to skate with the world champion National Finnish Ice Hockey team and treks through the Nuuksio National Park with comedic actress Krisse Salminen. The programme also dives into the sounds of the city from Sibelius to Heavy Metal. Quest meets musician Lauri Porra and the Helsinki Philharmonic Orchestra to learn more about the city’s affiliation with music. In addition, Esa Lilja, Professor of Heavy Metal, and metal band Battle Beast, explains to the programme why the nation’s love for this modern genre of music is central to its people’s DNA. This month on Winning Post, CNN International heads to Switzerland for “White Turf” – a race meeting held over three weekends in January in St Moritz which sees thoroughbreds battling for supremacy in the snow. Whilst the majority of the competitors hail from neighbouring countries, where similar weather conditions make training easier, there are a select few overseas entries. During the programme, host Aly Vance catches up with UK-based trainer John Best, in Kent, who puts one of his favourites for success in the Alps, Berrahri, through his paces before heading out to the mountains. In St Moritz, Vance immerses herself in the valley’s culture, which includes learning more about local discipline, and stand out crowd pleaser over the three-week festival, Skikjoring. CNN also takes to the slopes with overall winner of the event for the past two years, Valeria Holinger, to find out what’s required to excel in this daring pursuit. On race day, Vance joins fur clad fans too see both Valeria Holinger and John Best’s Berrahri compete on an exclusive five star resort’s frozen lake.